Even tho all in my head - look familiar? These creatures are draining me dead! You know, sooner or later, someone who "means something" - said in angst - will get this, and will do everything we've been doing over these years. They will eventually find someone who doesn't make you out to be a total drug addict, and this epidemic will surface. 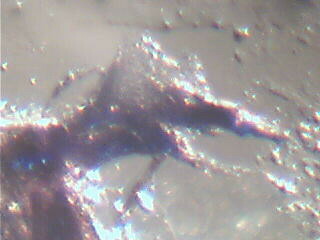 They will not be able to name it Morgellons, because remember, Morgellons doesn't exist, right??!! Shall we take some bets on what they'll name it? This new disease the health care "professionals" ignored and let people walk out of their office, to contaminate others, to live a life of pure hell, to be embarrassed to go into public with sores all over them. Sores you don't have to pick at, just take a shower or bath, they come right off, and there you have it! Another hole in your skin. A "doctor" told us to stop "excoragingh" - she thought she was a big deal, this so called dermatologist, and if we stop picking, they'd all go away. Same doctors who lied on our visit records. Do you know what a dermatologist is??? A wanna-be doctor who couldn't pass the test. I'd like to spend some time chatting with the electrician. He sounds like he really has his "crap" together & I'd kinda like to compare things. Could you leave me your email? I have more pics if anyone would like to compare! Keep in mind, these things with mouths, teeth, eyes, etc. are not real, they're just living in my head, and in my skin, and on my microscope slides. ...anyone else have their brothers of sisters??? I wake up more tired then I do when I go to bed. I keep very bad headaches all the time and I have so much trouble eating I've lost over 150lbs in 4 yrs. I stay so cold and weak. 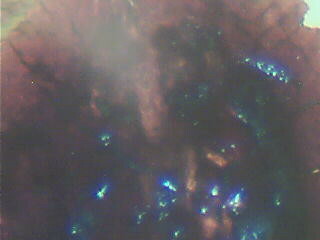 The fibers are in my mouth and eyes so bad it drives me crazy, although they are all over the body. I don't know what to do anymore I just wish I would die I'm so miserable my partner of ten years left me because of this disease.